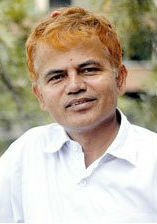 "Krishna Dharabasi" is one of the most popular writer of Nepal. 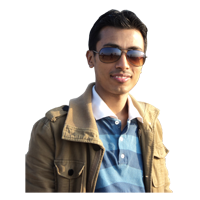 The actual name of Krishna Dharabasi is Krishna Prasad Bhattarai. Krishna Dharabasi was born in Amarpur Villege of Panchthar District, Nepal on 1960. As he is son of Tikaram Bhattarai, teacher of Amarpur Dhule School as well as Astrologer, he got good opportunity for study in his childhood. Dharabasi's mother Ambika Bhattarai was a housewife. Due to some Family problem Krishna's family moved to Jhapa District in 1967. As his grandparents neglected them Krishna's family has to go through poverty and shortage in childhood. Though Dharabasi continued his study and passed SLC in 1977 and completed Bachelor's Degree in Business Studies. Krishna Dharabasi has different way of expressing his feelings through his Novel and stories. His writing skill can touch any one who reads or listen his novel. Dharabasi has expressed the love and emotions through his Nepali Novel Aadha Bato, Radha and Jhola in such a way that readers gets watery eyes. Among the Nepali Novel and story, his story Jhola has been filmed as Nepali Movie. The movie is based on Sati pratha Prevail in Nepal and Jhola is directed by Yadav Kumar Bhattarai and screenplay writer is Deepak Aalok with stars of Garima Panta, Sujal Nepal, Laxmi Giri and many more. Among Krishna Dharabasi Novel Radha won the most popular literary prize in 2005 known as Madan Puraskar. It is also the best selling book of that time. Beside if you want to listen Ma Hideko Bato Written by Sita Ji visit Ma Hideko Bato.